As always, Hong Kong collectible company Hot Toys delivered a beautiful piece. 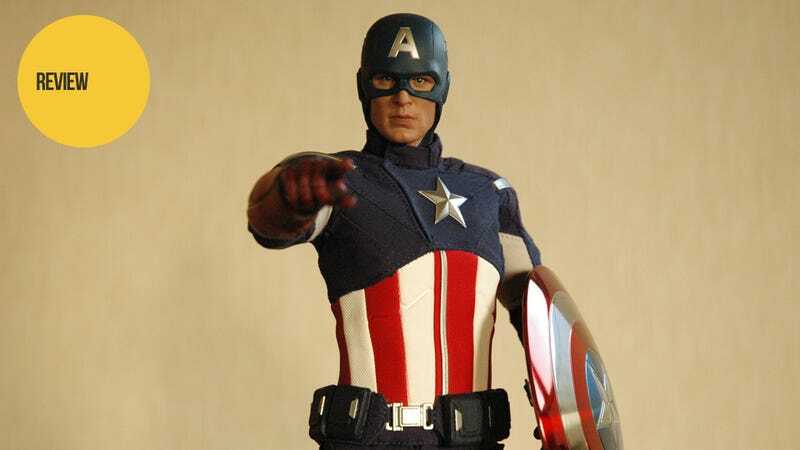 Cap stands proud and tall in his movie version modern day suit. The suit itself seems relatively simple in design, but still looks great, and being able to look at all the seams and lines you didn't notice in the movie makes you appreciate the work the costume designers went through. Unlike the previous Captain America movie version of the figure, this one comes with two shields; the standard, shiny, pristine version, and a battle-worn one (allow me to show my geek cred here by adding that it's only the paint that's damaged, since you can't damage vibranium) for various battle scene poses. This brings me to the next feature, which is the interchangeable non-masked head. With collectible figurines, it can generally be a hit-or-miss when it comes to the likeness of the figure in question. Hot Toys for the most part is usually a hit, which they display proudly on their website. The Rescue Version Captain America figure left a bit to be desired in the character's likeness, but with the Avengers version, Hot Toys was spot on. I wish my photography skills were better at conveying how good a job they did with this one (go take a look at their official photo gallery for that). I own several Hot Toys Movie Masterpiece figures, but the facial work on this one is by far the best. Cap comes with interchangeable head, 8 different hands, 2 shields, and a Chitauri blaster. The figure is available in the west through Sideshow Collectibles and, as of writing this article, is in stock.